Get Kawasaki insurance from Devitt today. We scour the market and compare prices from top UK insurers to find you our cheapest quote and the most comprehensive package. Devitt can provide Kawasaki Ninja 250 insurance or cover for the Kawasaki Vulcan 1700 Vaquero – and every model in between. We’ve been providing motorbike insurance for UK bikers since 1936, and with our reliable experts, you’re in good hands. Don’t forget you get an exclusive 10% SPORTSBIKESHOP discount code when you insure with Devitt. What can I expect to pay for my Kawasaki bike insurance? Kawasaki – powerful by name and powerful by nature. If stunning, sleek and sporty is what you’re looking for, Kawasaki bikes are perfect for you. Ride your Kawasaki to work? Or do you just hop on your bike at the weekend to see the open road? Kawasaki bikes are known for their versatility and power, and that’s why you’ll always find an extremely proud owner at the helm of one. Whatever your preferences, there’s a Kawasaki for you. It was in 1949 when the Kawasaki Company made its movement into the motorcycle industry – originally, by building engines for other bike brands, as well as engines for aircraft. It wasn’t until 1954 when Kawasaki released its very own motorbike, Meihatsu, which was fitted with Kawasaki’s own KB-5 engine. With the experience and knowledge of powering aircraft, it’s no surprise that Kawasaki motorcycles have been getting stronger with each and every launch. There are plenty of ways for you to reduce the cost of your Kawasaki motorbike insurance. If you’re cautious about locking your bike safely away with an alarm or immobiliser, this can help to lower costs. Keeping your bike locked indoors or in a garage overnight will also work in your favour when it comes to us comparing insurance for you. Another great way of saving money on your Kawasaki insurance is by completing further training – this could be with either IAM, RoSPA or ERS. Taking further training shows that you’re a cautious and careful rider could also help you save money on your Kawasaki insurance. 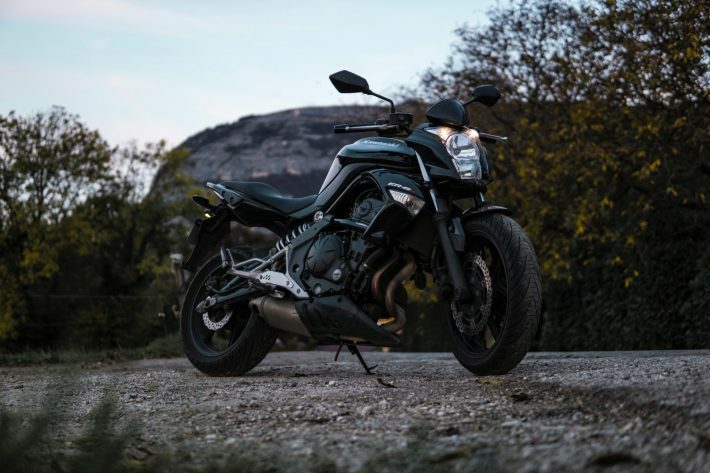 Your Kawasaki motorcycle insurance provides one of three levels of cover, depending on which you choose: fully comprehensive, third party fire and theft, and third party only. This includes a 24/7 claims line should you ever need to make a claim, as well as 90 days’ worth of cover across the EU – which could save you a significant sum of money if you’re a regular traveller across Europe. You can also add additional products to top up your policy, including Excess Protect, which could reduce the cost of your premium, as well as Key Protection to replace lost, stolen or damaged keys and to pay for any out-of-pocket expenses up to £1500. You can also take out Personal Accident cover, cover for your helmet and leathers (we know how expensive they can be to replace) as well as RAC cover specifically for motorbikes. You can get a quote online by filling in our online quote form. Just provide us with a few details, such as security for your bike, your location and occupation, mileage, driving habits and whether you have any No Claims Discount. We’ll also need to know about any convictions within the last five years. Get a quote online or call one of our friendly advisors on 0345 872 3614. Kawasaki are taking sports touring to a whole new level with the introduction of the Kawasaki Ninja H2 SX!